CelloJoe - Cello & Beatboxing - Classical Hip-Hop. International bicycle touring vagabond troubadour cellist beatboxer. CelloJoe provides unique entertainment for all types of occasions from weddings to graduation parties, kid's parties of all kinds, cello-grams, art galleries, special events, corporate gigs, looping demonstrations, conferences of all types, cafes, bars, clubs, festivals, and more! 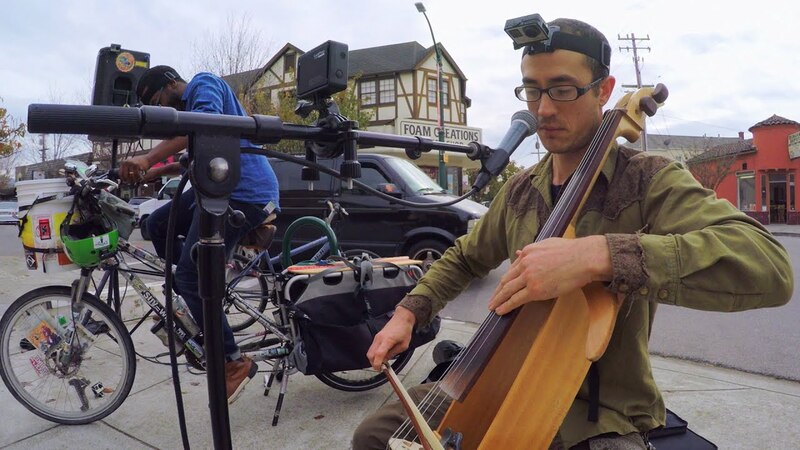 CelloJoe can also perform on a bicycle pedal powered sound system as a science demonstration or in locations where power is not readily available. Cello Joe’s performance bridged the spectrum of family and friends present for our wedding. It was such a magical experience seeing so many loved ones getting down to veggie maniac, bike girl and so much love <3. Cello Joe delivered a performance that brought joy and smiles to everyone’s experience. Overall I rate our experience 11/11. It was an honor to have such a talented musician perform and such a fun character to hang out with the rest of the event. Thanks so much for having me play at your wedding. What a great cake party you guys had! Wow! So fun. Lots of love to you.. So Much Love in fact! In short, run don't walk to book Cello Joe for your event! We booked Cello Joe for a high school event and had a fantastic experience, I would say for two reasons. First, Joey is a professional. Inquiries to him were responded to promptly; his paperwork was thorough; he was flexible and accommodating even given the threat of rain; he arrived at the venue when promised; he coordinated with our staff to understand the audio set-up we were able to offer; he made an effort to understand his audience in advance of the performance and he quickly unpacked and set up his equipment. But more importantly, it's clear that Joey is a real artist. He prepared a playlist which was different and yet perfectly suited to our audience. He timed the feel of the event perfectly such that he transitioned from playlist to live music just when the energy seemed right. He appealed to both adults with a real taste for independent music as well as high school kids with less sophisticated tastes. Thanks for the review Hilary! I had a great time and it was fun to perform for the high school students, faculty, and parents. CelloJoe is an amazing performer. He was definitely the musical highlight of our wedding. Everyone loved his music and it is perfectly primed for a ceremony or reception. He also has such a warm/inviting presence. He also went way above/beyond and taped his performance for us! I'd highly recommend CelloJoe for any gigs you might have - he's unique and possesses amazing musical talent. Thanks for the kind review Cody. It was an absolute pleasure and privilege to perform at your ceremony and reception. I with you and KT all the best! It was so great to work with Joey on our film! He was super flexible and did a great job acting! Thanks so much for the kind words, Nikki. It was truly an honor to officiate and perform at your mother's celebration of life. The love in the room was palpable. I wish you well and trust that you are supported so will by your family and friends. I wanted to play a joke on my guests at my birthday luncheon so I hired Joey to pretend to be a waiter. Except this waiter's accent kept changing from posh British, to outback Aussie, then back to posh British etc. etc. with a little French and far west thrown in too. He concocted a plausible, but hilarious story, to explain his accents and totally punked a couple of my guests - including my brother, who bought the whole story! The other guests figured out something was fishy but had fun trying to find an explanation. After lunch, waiter Joey transformed into CelloJoe and provided a wonderful outdoor concert for us on the deck. He started with mellow classical music but later switched to blues, bluegrass, and alt music the younger folks were familiar with and ended with Wheezer. Guest ages were from 29 to 79, but everyone loved the music and luxuriated in the atmosphere. Joey was definitely the hit of the party! He's a heck of a good waiter too! I highly recommend this talented and versatile musician! Thanks, Carol! Your party was so fun! I got to flex my actor/accent skills AND my musical chops. Not many gigs let you do that! Thanks for the creative leeway to craft my story and for having the idea to prank your friends. Joe and I met by chance during one of his performances at Revolution Cafe. Not knowing the full depth of his talents and only catching a glimpse, I invited him to my home for my birthday with friends. The result was an incredible one, all 20+ of my guests were astounded by the spectrum of his music. Another element that was completely unexpected was participation. Joe had all of my friends singing and dancing, two things that always equal genuine happiness and joy. I'd like to extend an eternal thank you to Joe for helping me throw an unforgettable birthday event. Cheers! Thanks, Michael! You and your friends were so fun to play for. I loved how you all really got into it and participated so fully. Cello Joe was great to work with throughout the entire process--from coordinating prior to the event to setting up and performing on the day. I originally reached out to Cello Joe to have him entertain my party with his amazing cello skills, but ended up hiring him to DJ due to my restricted budget. When my schedule went a little awry, he graciously kept the party going past our agreed-upon time and even busted out his cello to elevate the atmosphere while asking nothing in return. When you hire Cello Joe, you not only get a professional entertainer, you also get a solid event-coordinating teammate. Do not hesitate to hire Cello Joe for your event. I had a great time at your party and I’m glad everything went smooth. CelloJoe played at our company holiday party (more than 500 guests attended). He wowed the crowd with an eclectic mix of innovative, funky music and vocal percussion. We heard great feedback from several guests. I highly recommend CelloJoe for any gathering where a cool vibe is desired! Thanks for such a great review! I had an amazing time entertaining at your company's holiday party. That had to be one of the best events at which I have had the pleasure of performing. We had Cello Joey play for us for the first time tonight and besides his incredible talent and improv abilities, he knows how to play to his audience! Our group was thoroughly entertained and are already asking for a repeat performance! Thanks, Joey! Thanks for having me play! Looking forward to a repeat performance. We had cello joe and his singing, puppeteer partner as entertainment for our children’s Halloween parade. The kids were enthralled; it was such a dynamic and exciting performance. There were fantastic morals worked into some of the songs and skits, such as the importance of safety, eating vegetables, looking both ways and holding hands while trick or treating, etc. This, paired with beautiful cello music, a beat box tutorial and Halloween songs- I couldnt have asked for a better twosome to provide such captivating entertainment for kids and adults too. I received so many compliments on the entertainment choice. I highly recommended Cello Joe and we hope to use them again! Thank you for your review! We had an awesome time entertaining the kids with our music, puppetry and song. Hope you had a great halloween! We booked CelloJoe to do an hour of his beat box looping cello music. He was great! He did another hour as a DJ using a play list I sent him. Everyone thoroughly enjoyed his performances. He also was prompt and very professional. Thanks so much for your kind words Debra! I had a great time playing at your party. Great people, great food, and a great time. Enjoy your awesome home in Arizona! When I first got engaged, I knew immediately that I wanted Cello Joe to play at our wedding. Little did I know that in addition to his amazing cello set, he also DJs! He also has various equipment that you can rent for very reasonable fee - wireless mic, speakers, etc. Leading up to the event, he was great with the planning. His booking process was very organized and clear. He was flexible allowing us to submit any playlists and/or songs that we wanted for various parts of the wedding and reception and even familiarized himself with the songs beforehand. Our wedding day schedule was very complicated, but he did not miss a beat!! Because he was on top of the timing, our day was able to run smoothly and on time. He cued everything right on time and worked closely with our wedding coordinator to remain flexible throughout the day/night. His cello performance was , of course, amazing. Our guest loved his set and were thoroughly entertained. His DJing was equally on par. He was able to read the crowd and kept them dancing all night. He accommodated song requests from our guests too. All in all, I could not be more grateful that we had him there on our special day. He made it magical and easy with his professionalism and talent. Highly recommended!! Thanks Amy! It was a pleasure to play for you and Yuri and DJ a rocking dance party. I give all the credit to your amazing family and friends because all of you really brought it on the dance floor! I really appreciate you taking the time to leave such a nice review. You had a beautiful wedding and I want to thank you for trusting me with such an important event in your life. Lucky to have found CellJoe for our wedding! My husband and I were very lucky to have CelloJoe at our wedding recently. Joey played during our ceremony and he set the most magical tone for that really special and intimate moment. He followed by entertaining our guests with more contemporary songs during cocktail hour, completely mesmerizing everyone. He was even kind enough to take requests from some guests. We could not have asked for a better musician/person to help create such a warm, elegant and fun atmosphere. Not only is Joey incredibly talented, he is also wonderfully personable and professional. He answered ALL my questions quickly, patiently and thoroughly. He made this element of the planning process very easy during an overwhelmingly busy time. As our wedding approached, we were completely confident he would deliver and he did so beyond our expectations. He was even very cool to stick around and hang with us afterwards. We were grateful to have Joey at our wedding and can’t express enough what an extraordinary and unique addition he was to a memorable night. Thanks for trusting me with making your wedding magical. I had a really great time playing for you and your families. I also had a good time on the dance floor! Your clan has some really good dancers! Amazing Cello feature on my indie song!!! I hired Cello Joe to play Cello's on an indie rock song, he did an amazing job. he was fast and gave me a few different ideas. Awesome cello player and awesome dude. Thanks Joe. Thanks for your review Dominic. It was a pleasure working with you. Great tracks! We met CelloJoe at a street music festival on the Peninsula. Our daughter was dancing like crazy to his original tunes and so we dreamed about booking him for her upcoming birthday party. Luckily he was available on the date and he was quick to respond and commit to the performance. CelloJoe delivered more than we expected for the performance, adding kids' music and his natural playfulness made the event special and a unique musical experience for all our guests. He started his set with instrumental/beat-boxing and then moved to vocals/beat-boxing tunes and kids' music later on. Our daughter and others, again danced around like crazy, and everyone left with a unique and memorable experience. He is clearly a talented performer/musician that loves what he does. Everyone had a great time thanks to CelloJoe who set the mood for a cool kids' party. Joey was great. Super professional but fun. He played during a small dinner we hosted and people were so excited about it. Highly recommend him for any kind of event. I had a great time entertaining your dinner party. I first saw Joey perform at a Bicycle powered music festival in Golden Gate Park in 2013 and again at Yerba Buena Night later that year. He is uniquely talented, incredibly approachable, and very dedicated to his music. I reached out to Joey in May of 2015 to see if he would be interested in a very personal performance for myself and my lady-friend as part of our 1st year anniversary 4-day weekend. Not only was he interested but he made it a personal priority and helped me develop the plans on how to best surprise my sweetheart. The end result was a perfectly well-timed romantic event that you really only see in movies. My sweetheart never saw him coming, but then burst into laughter, surprise then tears after he emerged from behind a bush to deliver an acoustic Bach serenade. He was very well dressed for the occasion and he stealthily hid all of his gear in the bushes well in advance of our arrival to ensure the perfect surprise. After the cat was out of the bag, Joey set up his electric equipment complete with pedal-powered amplification, performed several original pieces, and made a valiant effort to do some very personal covers of my lady-friend's favorite artists (punk rock included!) while we enjoyed our picnic in Golden Gate Park (which was another surprise :-)! To add to the fun we took turns pedaling and powering the amplifier while Joey performed for our special occasion. We had a blast, took lots of photos, and made some awesome memories. It was truly a priceless experience!! Thanks for such an in-depth and awesome review Adam. It was such a great pleasure to perform such an intimate concert for you and your sweetie. I loved working out all the details and planning the surprise. What a priceless expression on her face as I strolled out from behind the bush serenading you two! Thanks again for the opportunity to make your anniversary magical and thanks for powering the sound system with your pedaling! I needed an actor for a short business commercial. Although Joe's listed background is all about the music, I hoped that his performance experience was enough to make this gig work. He exceeded expectations, on short notice with no preparation, nailing the desired lines and emotions, brought added depth to the role and script, and was great to work with. I would not hesitate to retain him again in any performing capacity. Thanks for the nice review Steve! It was fun working with you and I wish you success in your business! I was lucky enough to run across CelloJoe on Gig Salad. I had arranged a birthday dinner for my wife and several friends. The addition of Joey and his Cello and other instruments made the dinner beyond unforgettable. I highly recommend him and hope to be able to schedule him again. Thank you for such a wonderful evening Charles! You're definitely "the Host with the Most" when it comes to style, elegance, quality, and outstanding victuals. Again, thank you for the opportunity to entertain you and your friends. CelloJoe came to our 30 person private dinner and wowed all of the guests. He started with Classical music and then transitioned over to such a neat modern set with his looping and beat boxing - the guests were all about it! I would definitely recommend him. Thanks, CelloJoe! It was a pleasure to play for you and your friends Dave. Such a classy party and great people. Cello Joe is awesome! I first heard Joey's music at a yoga festival, and loved it, and realized that he would be perfect for my fiance's and I's wedding. Pretty much my favorite music ever is Cello/Viola/Violin looped over electronic (so that part was pretty obvious), and I also wanted something that wasn't too "wedding-ish" yet at the same time would please the more traditional family members while still being interesting for my friends. Plus, I really wanted my wedding to be a very personal experience, and Joey seemed like somebody I would want to be part of the inner circle, and not just a hired musician. I finally got up the nerve to ask Joey if he would consider, and, lucky for us, he was keen and the date worked! Besides the totally amazing music, Joey was super easy to work with. Joey was very good about asking exactly what we wanted, what times we wanted, etc., so I imagine that if you had a structured wedding plan, he would provide exactly what you wanted at an exact time. I, however, am not a good planner. I think my only instructions were "something wedding-ish that isn't the actual wedding song" and gave him a "schedule" that of course was only vaguely reflective of the actual timing of events. As if by magic, Joey started and stopped at all the exact right times. He went right along with the day as it unfolded without prompting, which was a godsend because if he had needed structured instructions, it wouldn't have happened. If there needed to be music, Cello Joe was playing, and if it was a part of the wedding where there needed to be silence, the music just stopped. Cello Joe definitely played a part in making it all happen. Everybody LOVED the music, from my closest friends to most distant relatives. And it was nice just having Joe there as a part of the wedding. Plus now whenever I see Cello Joe's name as part of the line up at a festival or party, I get a little giddy thinking "Yup, he was at our wedding. We're cool like that." We had the option of having a DJ for an hour that played with Cello Joe, and that was really cool too. Basically, we had Cello Joe play by himself for the outside processional, and then him and the DJ play together during the first part of the reception. Joey was very flexible when we said wanted only classical style cello at our event. He put together his own medley of Christmas songs that made everyone so delightful. It was so great. We highly recommend him for the events. We would love to have him again in our next event. Thanks for the kind review Alice. It was nice to play at your art gallery and I look forward to the next time! Through a friend,I luckily found CelloJoe to play at our wedding in Occidental, CA. From the moment I called him, he was incredibly professional, accommodating and kind. I did not have a worry in the world when I hired him and for great reason! As I got ready to walk down the aisle, his whimsical and heart steady melodies filled the Redwoods with all the beautiful raw emotion of a wedding. I definitely feel that he created an enchantment that day- after the ceremony, people couldn't help but smile and dance with his beats. We are forever thankful that CelloJoe was able to join us that day and express his magic for our family and friends. He is a true artist and wonderful performer. Thanks for the great review Whitney. Your wedding was so beautiful. It was a real honor to be a part of it. I recently had CelloJoe perform at a very small and intimate wedding ceremony. He learned 3 songs he had never performed before, but that were very meaningful to us. His first song brought my fiance to tears before the ceremony even began. We wanted something unique and memorable and CelloJoe was the perfect musician for the occasion. Would highly recommend him. Thanks for the review Stephen. I think just about everyone present was tearing up throughout the ceremony including me because it was such a beautiful wedding and you could just feel the depth of the occasion. Thank you for inviting me to be a part of such a momentous occaision in your life and I wish you two all the best life has to offer. After hearing Joey at the Far West Fest in Point Reyes Station, I thought he would provide the perfect energy to round out our staff appreciation party, as his eclectic style and mix would communicate to our staff's diverse backgrounds and tastes. We ended up with the best party in memory, with kids from 2 to 80 grooving to his beats, loops, lyrics and overall good vibes. Thanks very much for your kind review Steven. It was great playing for you and your staff. The kids were so cute! We'd definitely hire Joe again! What CelloJoe does is so unique and such a wonderful addition to any event where people enjoy live music. We hired Joey for our wedding celebration at a remote ranch in Sonoma County. Joey was just wonderful! He came with his fancy sound system, which he set up for us and which we used for all the toasts. Just before showtime, he changed into a very nice looking tuxedo. And he played beautiful music for us throughout dinner and beyond. When he wasn't playing his cello, Joey also DJed for us off his iPod and even helped orchestrate the musical accompaniment during my cousin's singing performance. After the event, so many of our friends commented to me about how much they enjoyed the music and where did we find this cool guy? Joey was also awesome to hang out with after the party, and it felt like he was just one of the guests. CelloJoe was a bit hit and I'd highly recommend his unique musical style for any event where you want the music piece to stand out. Thanks for the wonderful review YY! I really appreciate you taking the time to post it. Cello Joe is Great! not only is his music wonderful to listen to... he will happily fill your event with wonderful sounds. be warned, you will be sad when the music stops, so make sure you over estimate how many hours you need him for! Cello Joe played at my wedding and I loved every second of it. Thanks so much for posting your review! I really appreciate you taking the time to post your review and thank you for the honor of performing at your wedding. Utilizing only his voice, a cello and a loop pedal, he is able to take listeners on a sonic journey around the world and to far away galaxies. 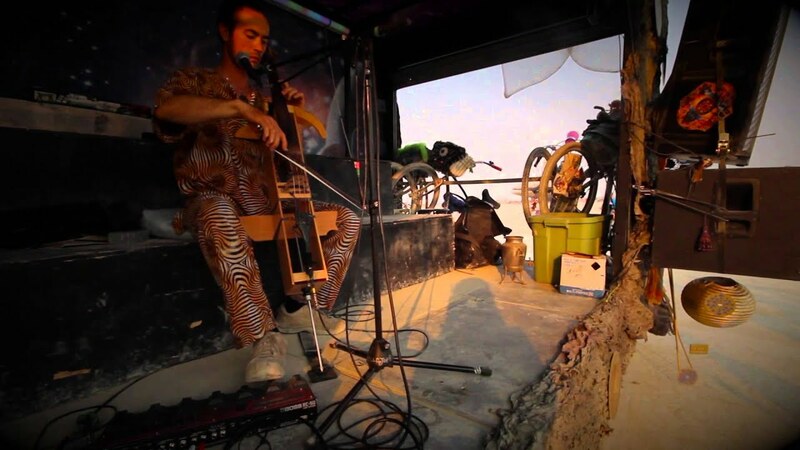 Without using any pre-recorded samples, CelloJoe is able to record live on the spot with a looper and produce intricate intergalactic tapestries of harmony, melody, and rhythm as well as mimic many styles of music from dubstep to folk to rock to classical to hip hop by beatboxing, throatsinging, singing, plucking and bowing the cello. By combining cello with beatboxing, he has created a unique genre: Classical Hip Hop. His looped and layered beatboxing beats (vocal percussion) and funky cello grooves form a rich soundscape for intelligent lyrics. CelloJoe spreads joy, laughter and consciousness raising vibrations everywhere he goes. CelloJoe's eclectic sound also incorporates the style of old time, jug band, blues and kids's music. Though he is able to perform classical music, he is also a pioneer of a new sound with the cello: Classical Hiphop. 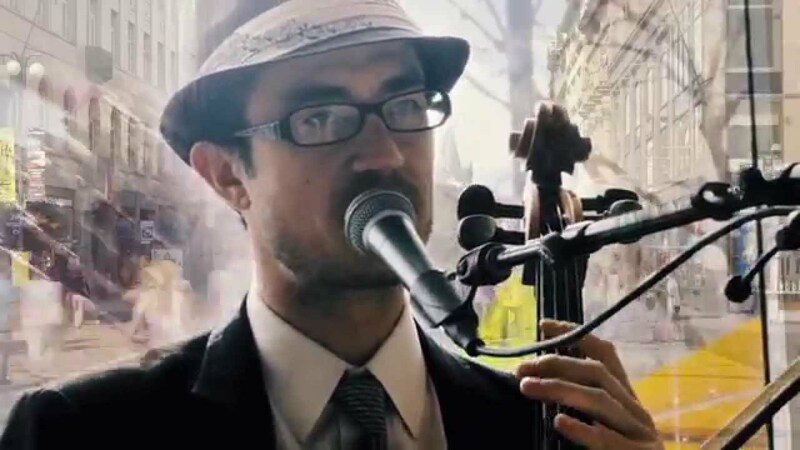 Combining cello with beatboxing, his looped and layered beatboxing beats (vocal percussion) and funky cello grooves form a rich soundscape for intelligent lyrics as well as instrumentals. Picture Yo-Yo Ma combined with Beardyman or Mstislav Rostropovich remixed with Rhazel or Pablo Casals and Doug E Fresh in one. CelloJoe spreads joy, laughter and consciousness raising vibrations everywhere he goes. CelloJoe's eclectic sound also incorporates the style of old time, jug band, blues and kids's music. Performance area must be shaded. Additional fees may apply if there is no shade provided. CelloJoe can provide his own sound reinforcement for an additional fee. • Two Shure SM58 vocal microphones or equivalent. My own original lyrical songs with vocals, beatboxing & cello music. I can provide my own sound equipment for an additional fee.